White-fleshed nectarines shipped from South Africa are in season now in your supermarket, for it is summer in the Southern hemisphere during our winter. I got a crate of them and have created several recipes that would be good during the holidays, even though we do not, in the Northern hemisphere, usually associate peaches and nectarines with Christmas. Blend the white nectarines with a squeeze of lemon juice and a tablespoon of sugar then add 2 tbsps to a glass and top up with champagne. 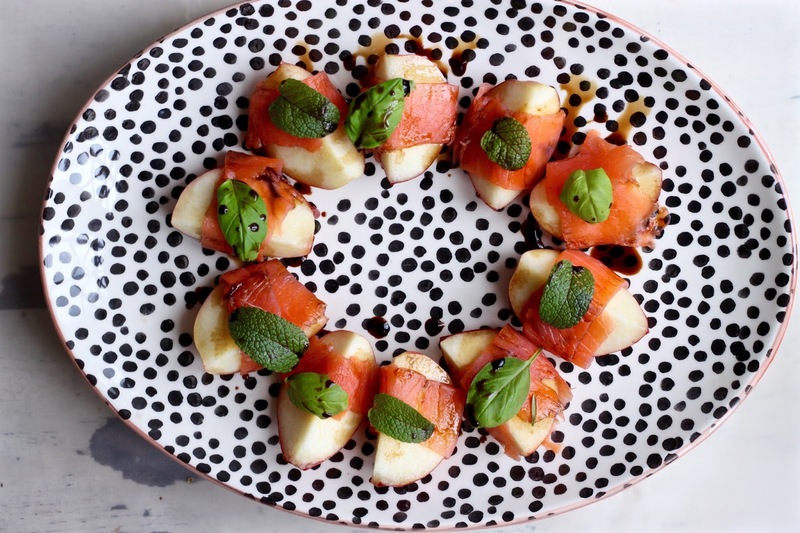 Rather like melon and prosciutto are a great combination in the classic Italian starter, nectarines and smoked salmon also work fantastically together: the honeyed crisp fruit and the salty, smoky salmon. This is both a good canapé for drinks and an excellent starter course: refreshing but savoury. It takes only a few minutes to prepare. Prepare the nectarines then wrap each segment in a strip of smoked salmon. Top with either a fresh mint leaf or a fresh basil leaf then drizzle with balsamic vinegar and grind on some black pepper. 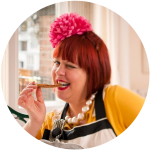 Christmas cooking takes a great deal of organisation so make sure that desserts are made in advance and starters are cold, easy to put together affairs. You’ve got enough cooking to do for the main course so try this delicious salad. 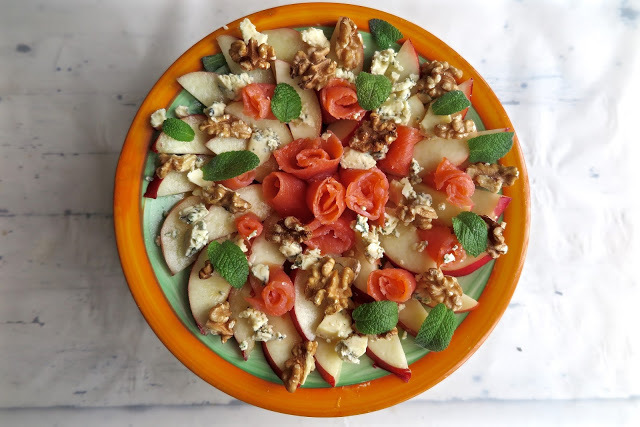 Prepare the nectarines, then place the half moon segments around the edge of the plate, creating smaller and smaller circles until the plate is covered. Make little smoked salmon roses by cutting the salmon into 3 x 5 cm strips and rolling them, standing them upright between the nectarines. Crumble the blue cheese and scatter it over the salad. Split the walnuts into halves and place them all over the salad, then continue with the mint leaves (choosing small leaves from fresh mint sprigs). For the dressing, add the oil and lemon and whisk until incorporated, then add the rest of the ingredients. Add more salt if you feel it needs it. I tend to use Maldon sea salt, which when rubbed between your fingers adds a lovely texture to salads. My family love a Christmas Day brunch, usually of Champagne, smoked salmon and scrambled eggs. 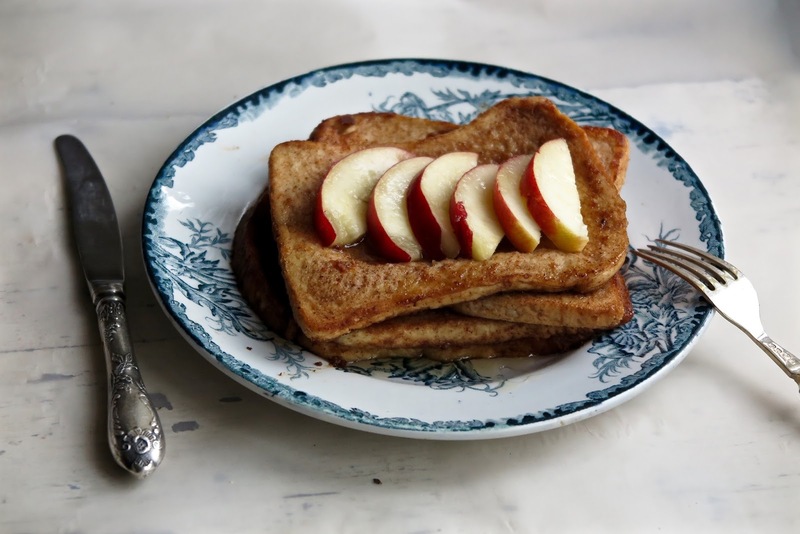 But this year we are going to try something different, though equally indulgent: French Toast with fresh nectarines. The White Nectarine Bellini would be a lovely drink with this brunch! Whisk together the eggs, milk, nutmeg, cinnamon, vanilla, sugar and salt in a wide shallow dish. Dip the bread into the mixture, making sure it is completely covered with the mixture but doesn’t get too soggy. Put the butter into a large frying pan on a medium to low heat. Place a couple of the slices in the pan and let them fry. Don’t try to turn them too soon or they will stick. Once they have cooked for a few minutes until golden brown, turn the bread over and cook the other side. Continue with the other slices. Serve with slices of the nectarine on top and drizzle with maple syrup. For the vegan version, replace eggs with 130ml of aquafaba liquid (the rest of a can of light-coloured beans). Replace the dairy milk with nut or soy milk. Replace the butter with vegan margarine (the ‘from scratch’ recipe is in my book V is for Vegan) or coconut butter or groundnut oil. Method is identical to the non-vegan method. It tastes great!